Instant Pot for the Time and Clean Eating Win! I’m not sure what it is about this time of the year, but everything schedule-wise seems to be completely insane! Meal planning and prepping are what really helps me to stay on budget and within my meal plan, but sometimes… it is just hard to even make it to the store! So I’ve been looking for mealtime solutions that are easy but also not full of junk. Let’s face it. Sometimes it’s a lot easier to just get something prepackaged or order takeout when your schedule is crazy. But I know that when I’m eating better, I feel better, and I have more energy! 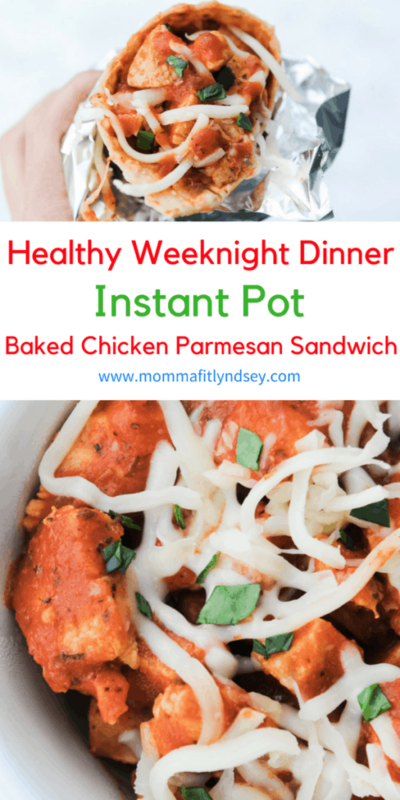 So, my Instant Pot has been getting a lot of love lately! I got an Instant Pot for Christmas and it’s been the most used appliance in our home lately! 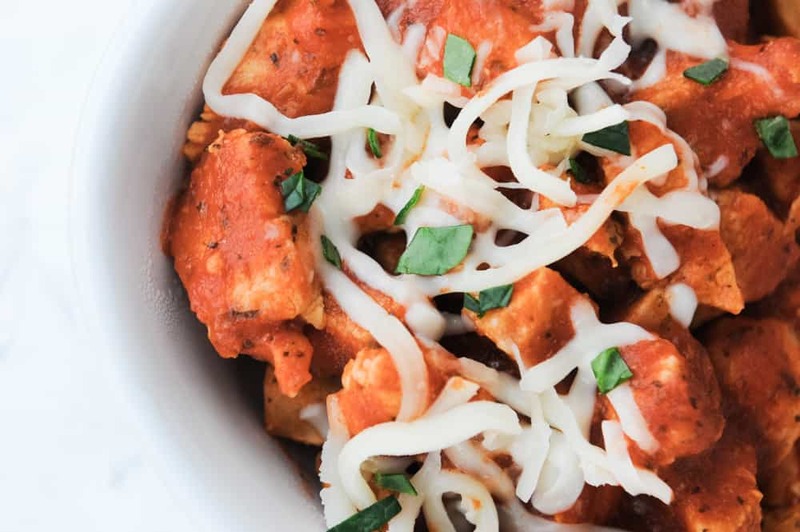 Instant Pot Healthy Chicken Parmesan = Good for you comfort food! When I’m focused on clean eating I often miss out on comfort food favorites, like chicken parmesan. I don’t know about you but when we’re busy, it’s easy to order a pizza or some yummy takeout. But this week I was determined to find something that was easy to make and could be a cleaned up comfort food! The ingredients are simple and few! Looking for another yummy clean eating weeknight dinner? What is your favorite type of food? I honestly don’t think I could pick just one. But topping the list definitely has to be Mexican or Italian. Another fave! This Weeknight Italian Chicken weeknight recipe is super yummy too, especially with gluten free coating and delicious balsamic glaze! Bonus tip! Check out Thrive Market or your local grocer and pick up Newman’s Own Marinara. I love the low sugar content and clean ingredients. Definitely a winner for this recipe! Don’t have an instant pot? Here are the stovetop directions! Check out the recipe below for ingredients! You can print the Instant Pot directions below! Chicken can be pan-sauteed in 2 TB olive oil and spices for 3 minutes. Coat chicken with covering of pasta sauce. Let chicken simmer over medium-low heat in sauce via skillet for approximately 5 minutes or until cooked through. Always make sure your chicken is cooked to 165 degrees before serving. But if you are interested in getting an Instant pot, here is the one I use. Seriously a lifesaver my friends! Sandwich or zoodles, your pick! This recipe is delicious on its own served over zucchini noodles. Danielle Walker has my favorite Zoodles recipe that I use all of the time! Even my oldest loves zoodles, they are that good! But for this time, I turned it into a healthy chicken parmesan sandwich! Clean eating doesn’t have to be boring. The last thing I want to do is to eat plain rice and boiled chicken every night. With just a few tweaks you can turn your comfort food and family favorites into clean eating and healthy versions. I would also pair this with a yummy and fresh greens salad! I loved this Italian Dressing Recipe by the Whole Cook. Perfect pairing wouldn’t you say? What is your favorite unhealthy meal that you would love to see a lightened up spin on? Tell me in the comments! Heat up your pressure cooker: hit Saute and adjust to "more". Wait until Instant Pot reads "HOT"
Add olive oil to Instant Pot, add chicken and saute for 3 or so minutes, stirring constantly. Be careful not to leave any parts stuck to the bottom of the pot. Hit cancel to stop saute mode. Add enough sauce to just cover the chicken. Coat chicken thoroughly by stirring. Close Instant Pot lid and cook on manual pressure for 5 minutes on high. Let release naturally for 10 minutes then turn off. Release remaining pressure (be mindful not to put your hand or face near spout). Once released, open the lid. Chicken can be served over zoodles with basil and 1/4 cup mozzarella cheese sprinkled over top. Let chicken mixture rest in Instant Pot on "keep warm" mode if sauce is too thin upon completion. For baked sandwiches, spoon half of the chicken mixture into lavash or other flat bread. Sprinkle each serving with 1/4 cup mozzarella cheese and basil. Bake for 10 minutes in a 350 degree oven. What scrumptious and tantilizing pictures! 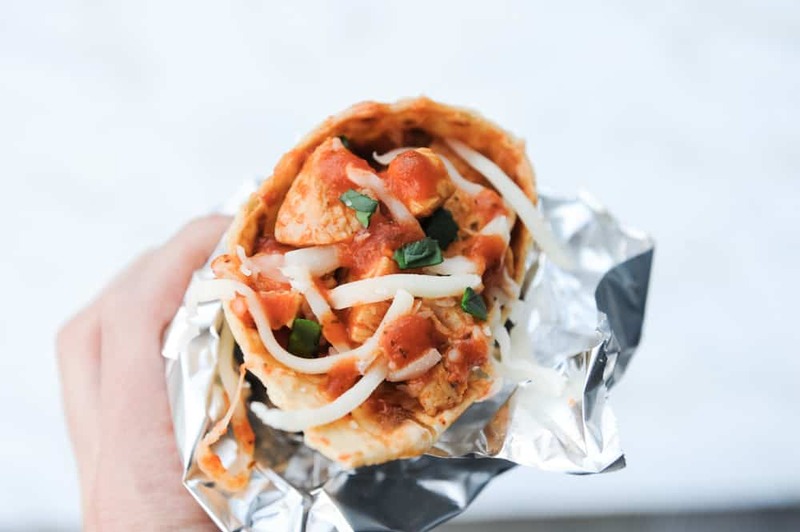 Putting this in a wrap is a great idea and affords all kinds of “dinner on the go” options. I often find with busy lives non-portable food seems to stay on my menu & ambition list rather than make it to our bellies. Thank you for sharing! You’re right! Portability is definitely key! thanks Katie! This looks absolutely delicious! 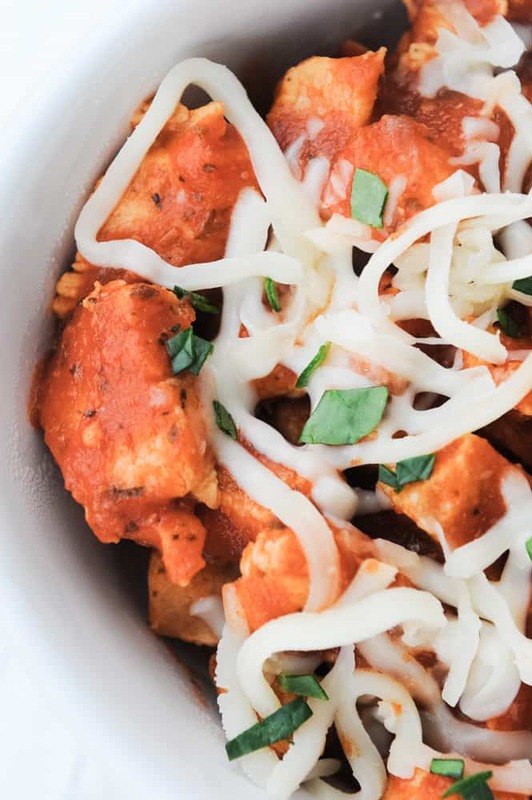 I love chicken parmesan, and I love finding easy, healthy alternatives for the foods I love most. Thanks so much for this! I agree! love lightening up not so healthy favorites!! oh my gosh yes! i def need to get an instant pot bc this look amazing! My instant pot is my best friend!! I def recommend one! Thank you for including the stove top directions for those of us without an Instant Pot! Your photos are great! It’s only breakfast time, but I could be hungry for lunch before too long! you got it!! I know, it makes me so hungry too! Thanks Kristin! This sounds so yummy. Don’t have an instant pot so the stove top will have to work for now 🙂 I’ll be trying this recipe soon. Thanks! This looks so yummy! I don’t have an instant pot but have heard so many raving reviews…maybe it’s time to get one! You definitely need one! I love mine! 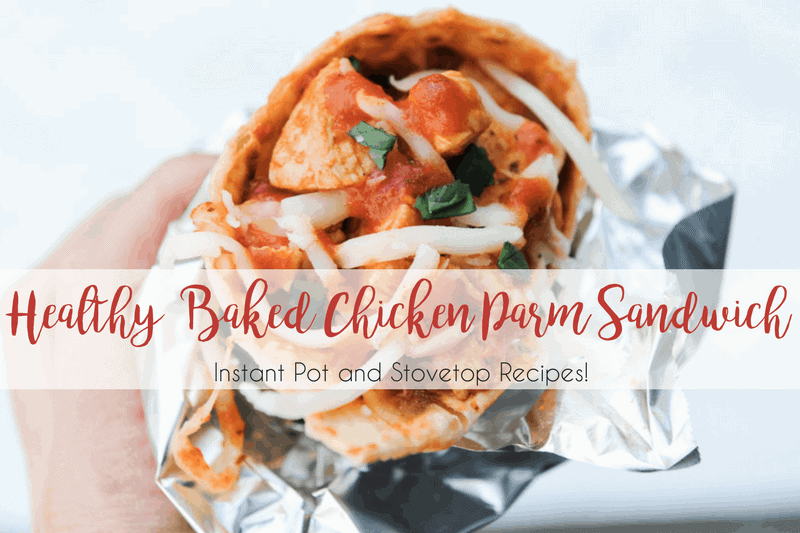 The fact that it is healthy AND made in an instant pot makes me already love it! I agree!! It’s a double bonus! Yum!!! I love chicken parm so I definitely have to give this a go! it’s so good right?? Thanks Kasey! I don’t have an instant pot but this is making me soo hungry and looks sooo yummy!! You can definitely still make it without an Instant Pot!! But you need one too ha! Wow, this looks so good! Chicken parm is one of my favorite meals. I’ve been trying to eat healthier lately, so I really want to try this…also love how easy it looks to make! I love it too!! both the healthy and unhealthy versions LOL! glad you got a chance to check it out, thanks Holly! mmmmmmmmmmm looks so yummy! Ill be adding this to my meal plan this week! hope you love it!!! It’s on regular rotation around here! Instant pot recipes are amazing! This looks so good too! I love my Instant Pot! Thanks for checking it out Kara! Love my instant pot! This looks AMAZING! I can’t wait to try it! Instant Pot for the win!!! thanks Leah! I need to try this! I love cooking in the Instant Pot! This looks so easy and delicious. Thanks for this recipe as it looks like a keeper! Thanks Autumn! Hope you enjoy it!